Every Tuesday at least 600 tonnes of seafood takes to the skies from Oslo International Airport. In addition, a substantial amount is packed and made ready for loading on to trucks that will transport the goods to other airports in Europe. It’s so cold that a steamy vapour leaves Martin Langaas’ mouth, as he enthusiastically points up towards an Emirates Sky Cargo aircraft, which is coming in for landing on the east runway at Oslo (Gardermoen) International Airport. 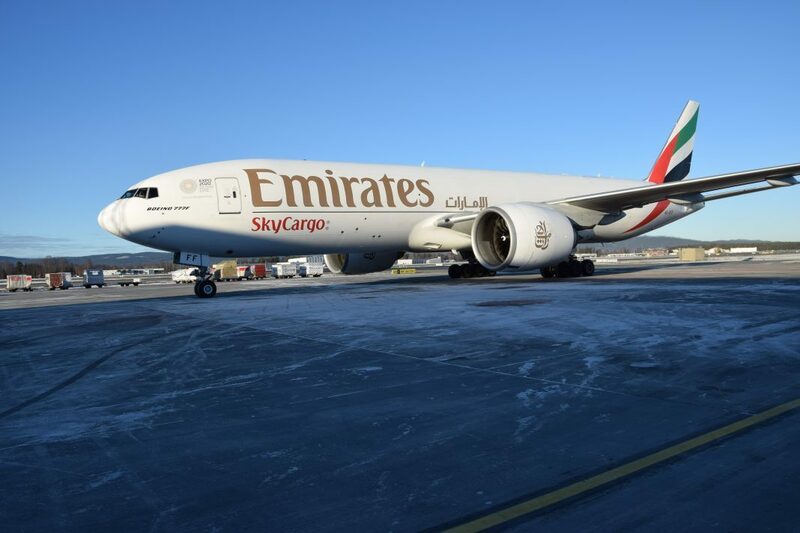 “Emirates are arriving here today with two cargo planes to collect salmon and other Norwegian seafood,” he tells SalmonBusiness. We are standing in front of the site of what will be the new seafood centre, where pallets of salmon are lined up on both sides of the aircraft park slots. Polystyrene cases filled with salmon stand piled high on top of each other, exactly how they left from the harvest plant, but with a canopy over, to prevent birds from helping themselves to a free sushi. At peak times there are 20-25 pallets waiting ready to be sent with a single aircraft. Each pallet contains four tonnes of salmon. Tuesday is the bumper day for salmon exports at Gardermoen. Eight cargo planes are collecting salmon at the airport today and flying to cities such as Doha, Tel Aviv, Seoul and Istanbul. From there most of the salmon is sent on to other cities and towns. Some of the salmon is also loaded into the cargo hold of passenger aircraft for transport to cities in the United States and Asia. 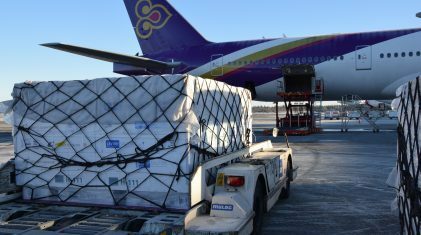 In total at least 600 tonnes of seafood is flown out from Oslo Airport every Tuesday, in addition to considerable volumes that are packed and made ready for dispatch by truck to other airports in Europe. “This here is my golden ticket,” says Langaas, understandably with some pride. Out on the airport apron we see workers busily loading salmon on board a Korean Air Cargo aircraft. Not too long afterwards Emirates will be manoeuvring in here, to also load up with fish. Langaas asks the captain in Korean if he can take a look inside. “Yes, but don’t take any photos,” replies the captain. Langaas sidles his way through a narrow doorway into the cargo hold. Rows of cargo stand here, two pallets across, perhaps 10 pallets to the end. The steamy breath from my mouth is replaced by my nose catching a whiff of raw fish. Loading is going on in the same manner underneath the cargo hold floor, explains Langaas. The Koreans have almost finished loading, but there still appears to be plenty of cargo space left in the aircraft. “Salmon is an extremely compact product,” explains Langaas. “It weighs a lot in relation to the amount of space it occupies. When captains check over the cargo, after which they receive the consignment papers and then see how much the cargo actually weighs, many are taken aback when they see how close the aircraft is to its MTOW (maximum takeoff weight).” An aircraft of this type can transport just over 100 tonnes. It’s rarely filled just with salmon, but up to 80 tonnes (of salmon) is not uncommon. These salmon are being sent by an ordinary scheduled aircraft. As the mail plane that will be collecting a consignment of crabs at Lakselv taxis out from the apron, we get into our vehicle and head off in the direction of the area airport staff call “non-Schengen”. Today, this is where big aircraft are parked ready to fly to Los Angeles, New York, Bangkok and Dubai. Goods being loaded into cargo holds include pallets of salmon. 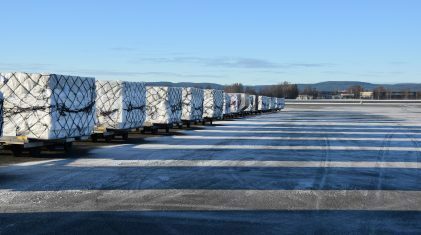 The volume here differs greatly from that loaded on to the cargo planes, but this cargo accounts nonetheless for a considerable portion of salmon exports from Gardermoen, explains Langaas. “There’s a number of reasons for the massive volume of salmon being sent on Tuesdays. On a global basis, Tuesday is a day with low demand for air cargo. That’s when fish become attractive. 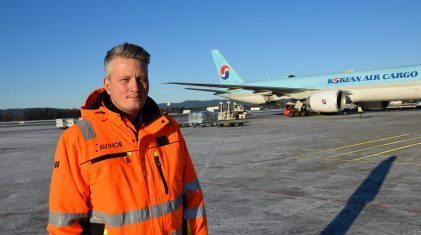 Another reason is that most of the Tuesday flights out from Oslo Airport are adjusted so that the seafood reaches the customers before the weekend in Asia,” he says. Due to the time difference to Asia, the aircraft arrive first on Wednesday morning. The bulk of the salmon is sent on from there to other towns and cities by other aircraft, trains, or trucks. Only four percent of the salmon sent from Gardermoen goes direct and the shortest route to the market. “It usually takes an extra day. Thus, the salmon is first ready to be sold as sushi in the shops on Friday,” says Langaas. Even though Tuesday is the big day for salmon export, cargo planes also take off with seafood on other days during the week. In total there are around 20 departures with cargo planes directed weekly at the Asian seafood industry. In addition, there are the intercontinental passenger routes with up to 10 daily departures to North America, Africa and Asia. On average these take about 20 tonnes of seafood per departure. “We believe the future for the seafood industry lies in the type of freightage where the fish are flown in combination with passenger transport. Aircraft that are designed specifically for transporting cargo are extremely expensive, have a high-risk factor and are difficult to absorb via global HUBs. In the global market the trend is such that airlines are increasing cargo capacity with their passenger aircraft, and the majority of airlines are phasing out aircraft that are purely built for cargo,” says Langaas. In total 90 000 tonnes of seafood was dispatched as air cargo from Gardermoen in 2017. Last year total volume of seafood production from Norway that was earmarked for air cargo amounted to around 220 000 tonnes of seafood, most of which left the country by truck bound for other airports in Europe, including Amsterdam, London and Helsinki.